The Hulkbuster armor is prominently featured in the latest Avengers: Endgame international promo art. Bruce Banner manned the armor in Infinity War after Hulk decided that he no longer wanted to help Banner. More than a few Marvel Cinematic Universe fans were under the impression that Hulk was scared of Thanos after suffering defeat at the beginning of the movie, but the Russo Brothers have confirmed that wasn't the case. Instead, Banner and Hulk are going through some personal issues that will hopefully be straightened out in Endgame. 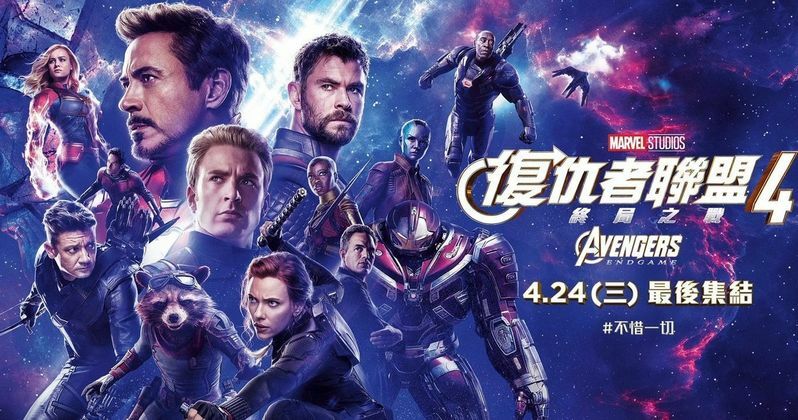 The new Avengers: Endgame promo art is from Marvel Studios Hong Kong and it is a lot different from the North American poster, though it does feature some of the same elements. Earth's Mightiest Heroes are clustered in a similar manner, but with different poses and Bruce Banner is moved from the center and off to the side in the promo art, next to the Hulkbuster armor. It isn't clear if the armor will make an appearance again, but the international promo art seems to suggest that it will. We have yet to see Hulk in the Avengers: Endgame trailers and TV spots, but he has been pictured in concept art, along with other merchandise. Earlier this week, he was spotted in a Funko Pop! 2-Pack with Thanos and he's wearing the Quantum Realm suit, which started speculation about a possible rematch between the two. If that's the case, then Banner really isn't going to need the Hulkbuster armor anymore, so maybe someone else will be utilizing it this time around, maybe Rocket Raccoon will get in on the fun. The armor certainly looks like something that he would be interested in. It is possible that Banner will use the armor for a portion of the sequel. Like all of the previous promotional material, the latest Avengers: Endgame art does not feature any of the Decimated heroes. Marvel Studios is keeping them all under wraps for the time being since we don't know how or even if they will be resurrected when the time comes. Popular fan theories believe that time travel will factor into the story, which seems obvious, but almost too obvious since the Russo Brothers have teased that fans have no idea what they're about to see. Avengers: Infinity War hits theaters on April 26th in North America. However, it opens on the 24th in many international territories, which means that there will be plenty of spoiler material well before North American audiences get to see the sequel. With that being said, it will be a good idea to avoid certain sites and social media pages that like to spoil things just for the fun of it if you would like to go in completely blind. You can check out the Avengers: Endgame promo art featuring the Hulkbuster suit below, thanks to the Marvel Studios.